Teachers can tell when they are effective. In my first year as a special education teacher in a pre-kindergarten setting, the signs were small but profound — a nonverbal student who started to greet me in the mornings, a student who didn’t know how to hold a pencil properly who learned to write full sentences about books he read, a student who memorized over 100 sight words, and a student who didn’t know his numbers who began to start adding and subtracting. My principal also noted this growth, and his vote of confidence helped me earn a Rookie of the Year award at Los Angeles Unified School District while I was teaching on an intern credential. It’s this experience that makes me seriously doubt the California State Board of Education’s new plan to label thousands of teachers as “ineffective” based solely on the credential they bring to the classroom, not their or their students’ performance. In fact, many of the fellow intern credentialed teachers that I have taught with have not only shown mastery of classroom management and instruction but also exceeded the expectations of their administrators and were recognized at their school sites. By September 18, every state must submit a school quality plan to the U.S. Department of Education under the Every Student Succeeds Act or ESSA. One component of the plan addresses teacher quality, in an effort to inform parents and taxpayers if schools are providing strong teachers to all of our students. Earlier this month, the board of education proposed that all teachers who complete a traditional teacher training program and hold a “full” license would be considered effective, regardless of how they or their students are performing. All teachers enrolled in a nontraditional, intern credential pathway – like the one I was in my first two years – would be considered ineffective. Born and raised in Koreatown, I was aware that not all students were getting the same quality of education. As a student in LAUSD, I noticed this disparity when I saw friends in more affluent communities receive funding for summer abroad trips to Europe and engineering programs. Respectively, I would hear stories of students in less fortunate communities who had to sit on the floor during the first month of school and share textbooks due to a shortage in school supplies. As I approached graduation from UCLA, I wanted to address that inequity by becoming a teacher. I looked at graduate school programs but realized I would need to work for a couple of years before I could afford to take the traditional path. That’s when I discovered a nontraditional program that would allow me to work as a salaried teacher for up to two years, under the supervision of instructional coaches, while I earned my full credential. It offered an AmeriCorps grant to help offset my education expenses if I worked in a high-poverty school, exactly where I felt I could make the most difference. And I was surrounded by a network of experienced and resourceful educators who offered their knowledge and expertise in the classroom. My experience is not unique. Thousands of teachers of color and individuals who, due to family obligations, need a salary while going to school enter the teaching profession on one of California’s 77 accredited intern pathways each year. In fact, the intern pathway is California’s most diverse pipeline – nearly half of intern credentialed teachers identify as people of color, compared to 34 percent of the teaching workforce and 76 percent of students. This fall, I start my third year in the classroom. All of my students are diagnosed with Autism, varying on the spectrum. Each has an individual learning plan tailored to their needs and abilities. I will meet with my school administrators and parents regularly to chart their growth. It strikes me disingenuous for the state to claim I was ineffective my first year but will be effective this year and every year going forward without ever looking at any benchmarks. I urge the state board to adopt a definition of teacher effectiveness that considers students’ learning and growth. It is imperative that the state board continues to validate teachers based on the growth of their whole students academically, mentally, and emotionally. Especially in high-need communities where teacher shortages continue to remain a problem, we must empower and support the teachers who strive to make a difference. 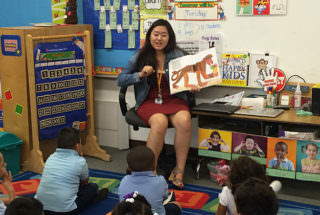 Haena Shin was a 2015 Rookie of the Year at LAUSD, earned her master’s degree in urban education from Loyola Marymount University, and served in the 2015 Teach For America-Los Angeles corps.